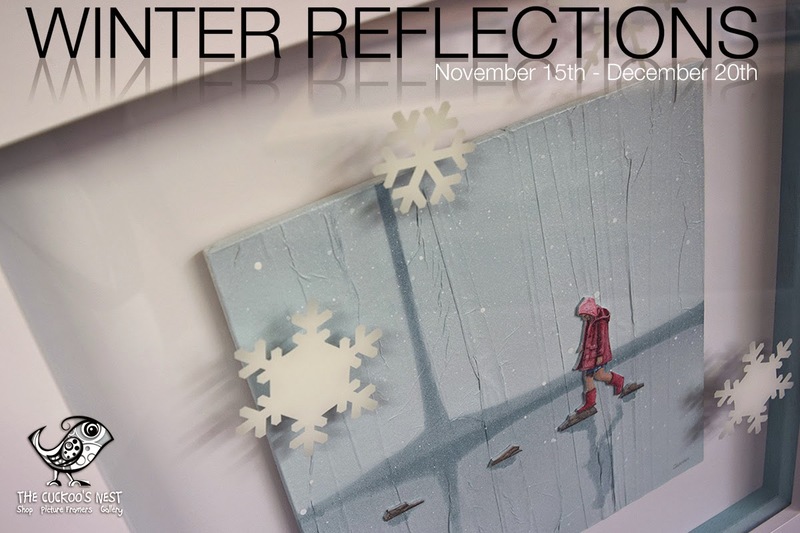 Our Winter Reflections exhibition this year runs from November 15th until December 20th It incorporates the Oxfordshire Artweeks Christmas Weekend of November 22nd-23rd. 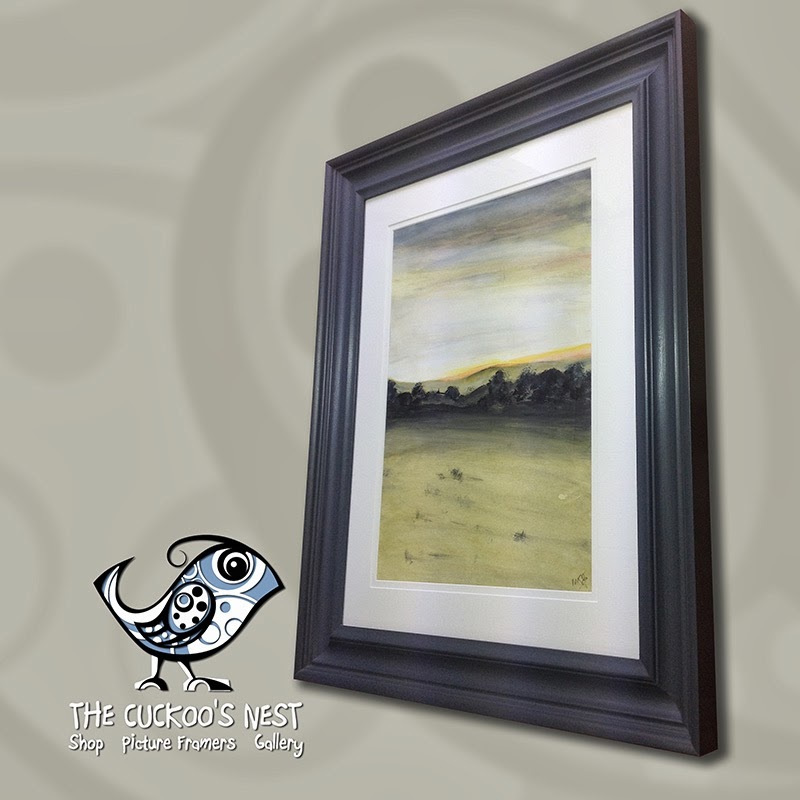 We will be showcasing a new group of paintings by Graham Rice which depict the enchantment of a winter landscape. This series of work is based on figures of children in evocative woodland scenes - skipping across stones, hiding behind trees, watching the fall of leaves. 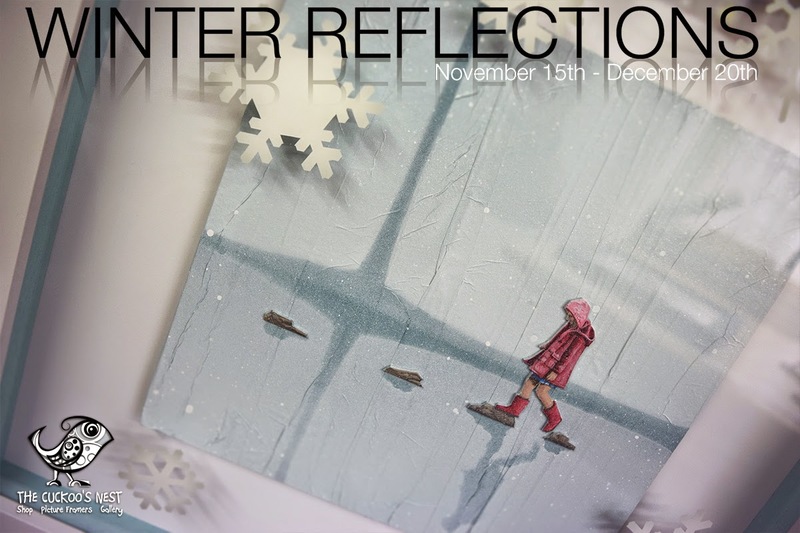 Reflections of figures in the water and shadows against the snow add to the nostalgic and narrative feeling in these pieces. 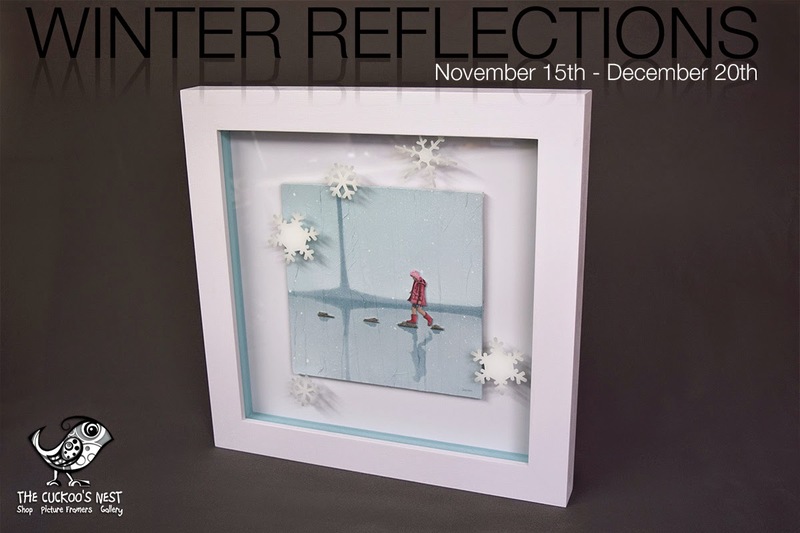 The paintings are all created in mixed media in cool and subtle wintry colours, featuring new three-dimensional devices such as trees and snowflakes painted on the glass itself, in the forefront of the paintings. 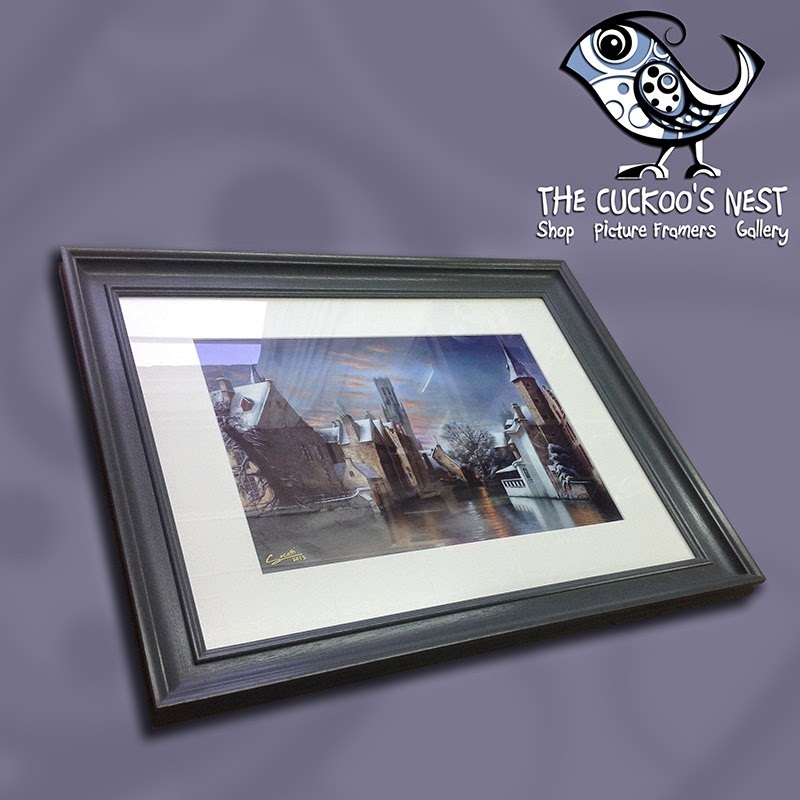 This creates a unique eye-catching and subtle layered effect. The exhibition will also feature new winter jewellery designs by Sheila Raven, inspired by the leaves and berries found in a forest in the winter. The collection includes beautiful textured silver oak, ivy, holly and mistletoe leaf earrings, with matching pendants made of complimentary leaves in both silver and copper with acorn or berry embellishments. The saw-pierced and beaten leaves create a stunning natural look. All of the artwork in the Winter Reflections exhibitions is inspired by our rural workshop setting in the woods and fields of the Cotswolds landscape. 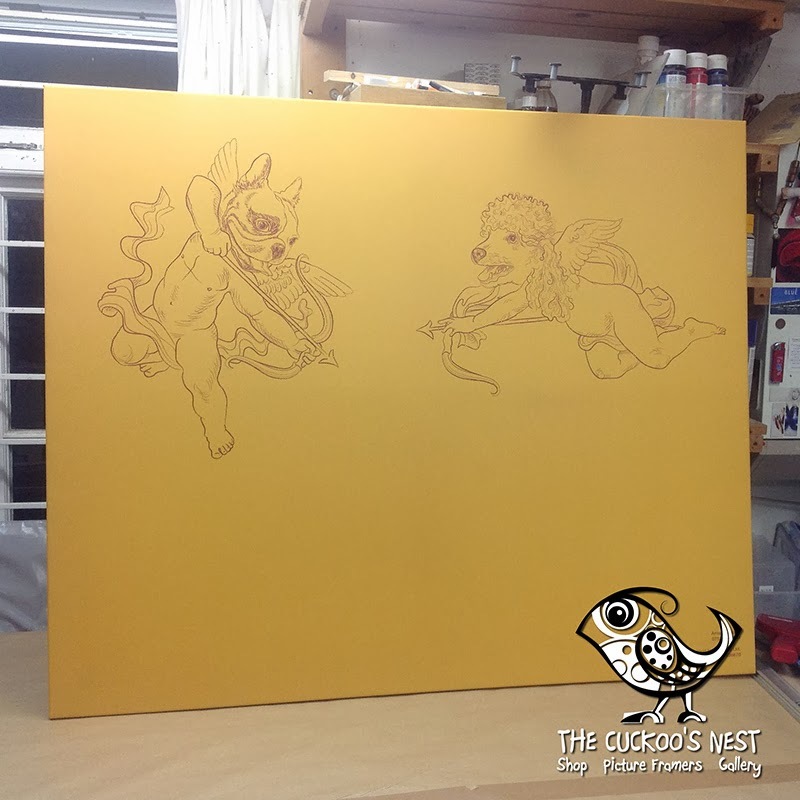 As is often the way in life however, granny came to the rescue, bringing the painting into us to see if we could do anything…We removed it from the broken stretcher bars, flattened everything, stuck it to a new piece of canvas and stretched that to a new support. 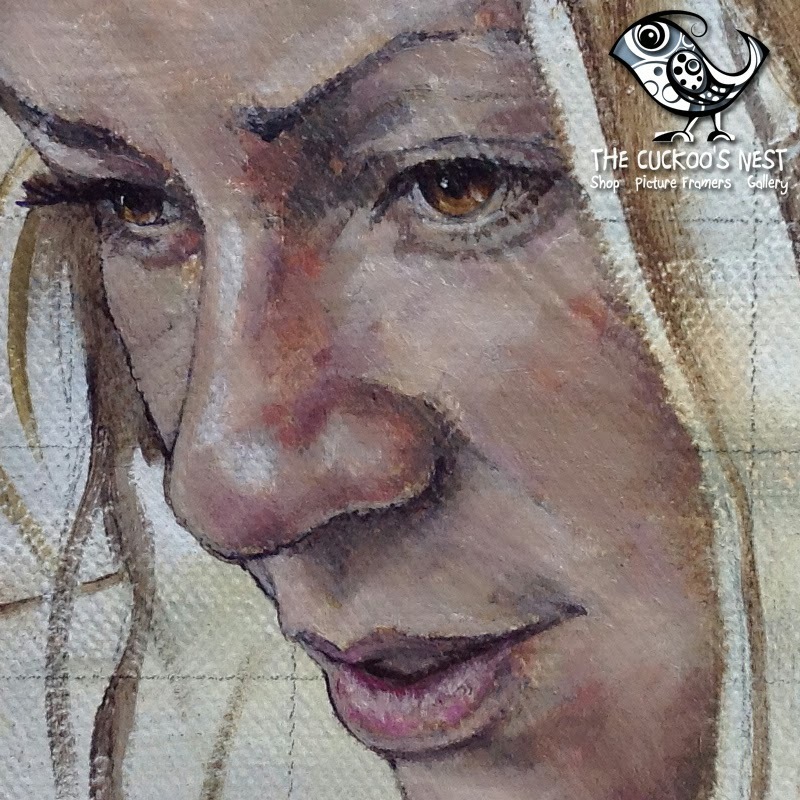 Here is the portrait of Jodie all finished. I’ll get it framed up next week then it’ll be up on the wall :) I’ve added a photo of the palette i used, for anyone who’s interested. 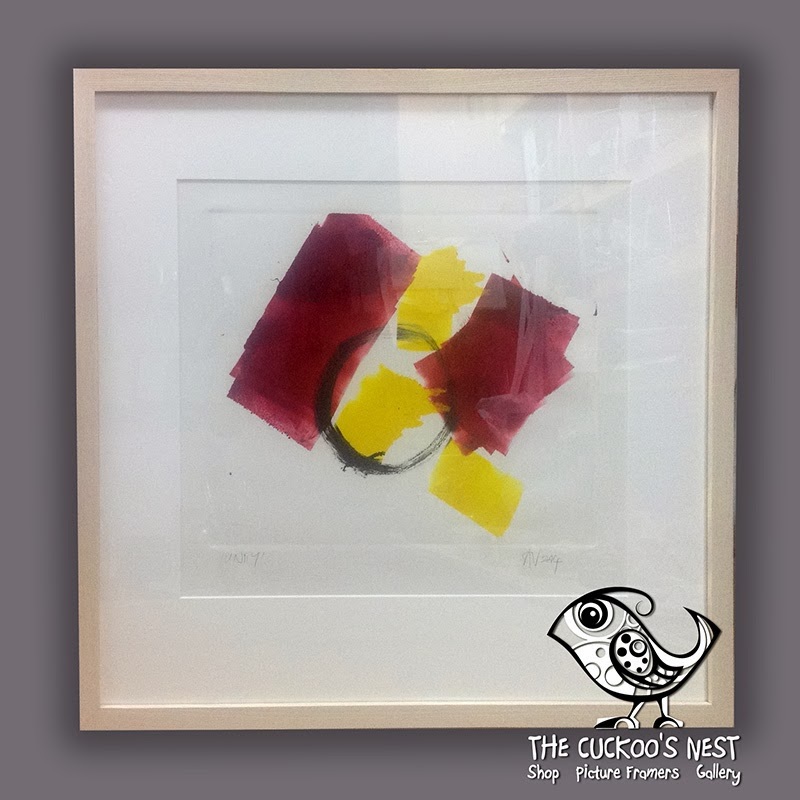 Here’s another of the pieces we framed for Maureen’s exhibition at SOTA. 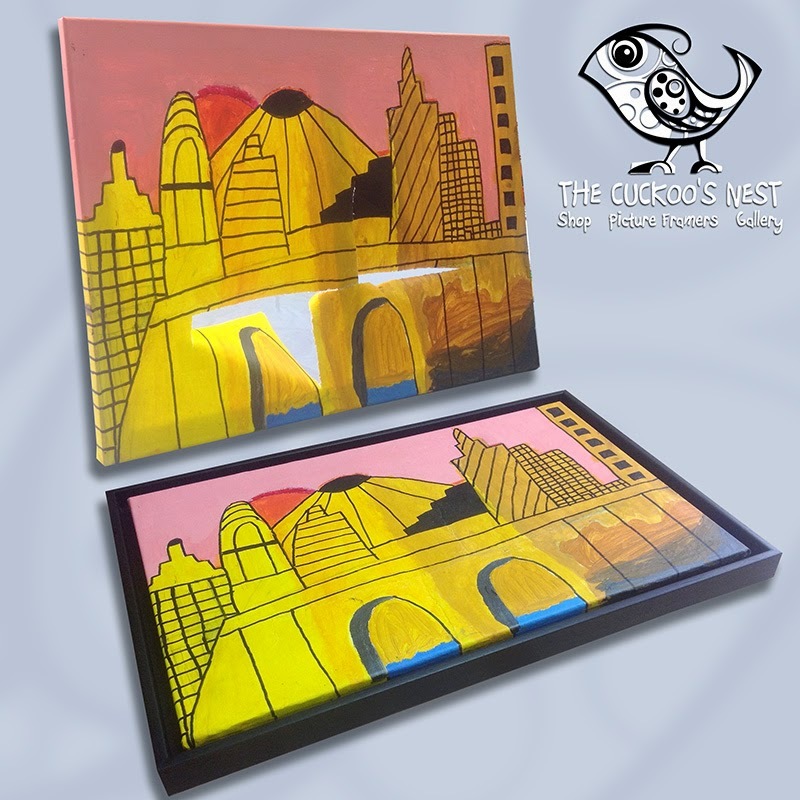 A beautiful acrylic sunset. 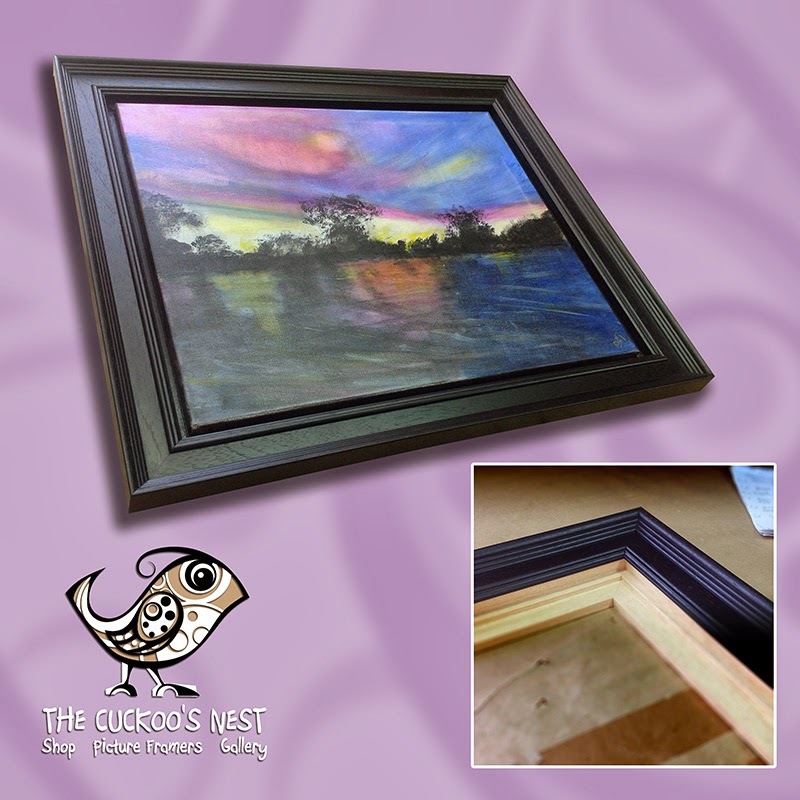 We floated the canvas within the frame by adding a small tray (the unpainted piece in the inset photo). 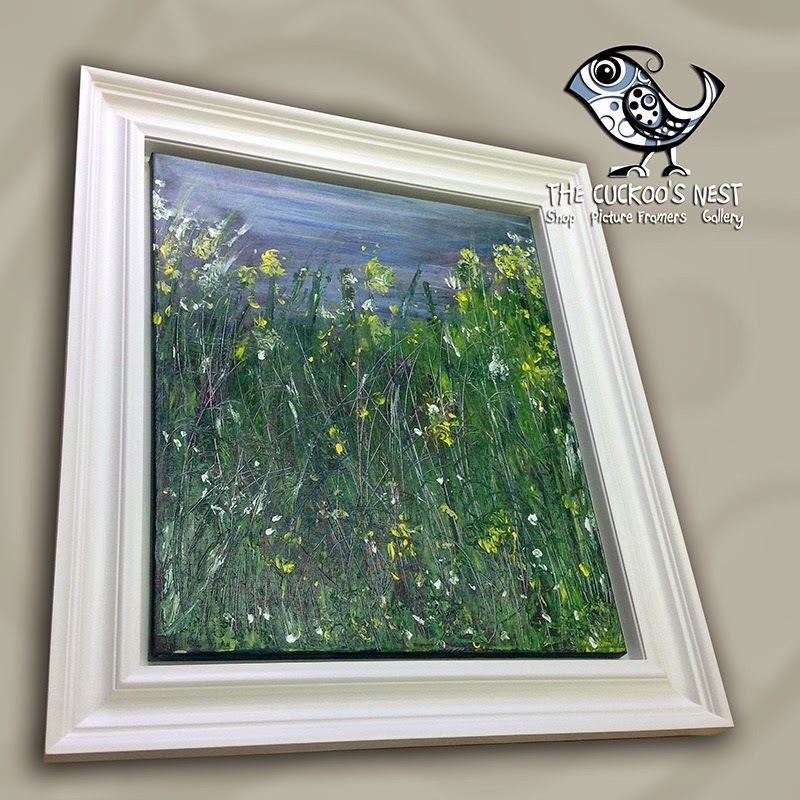 Once painted this adds a lovely detail to the frame, giving the canvas space to breathe. 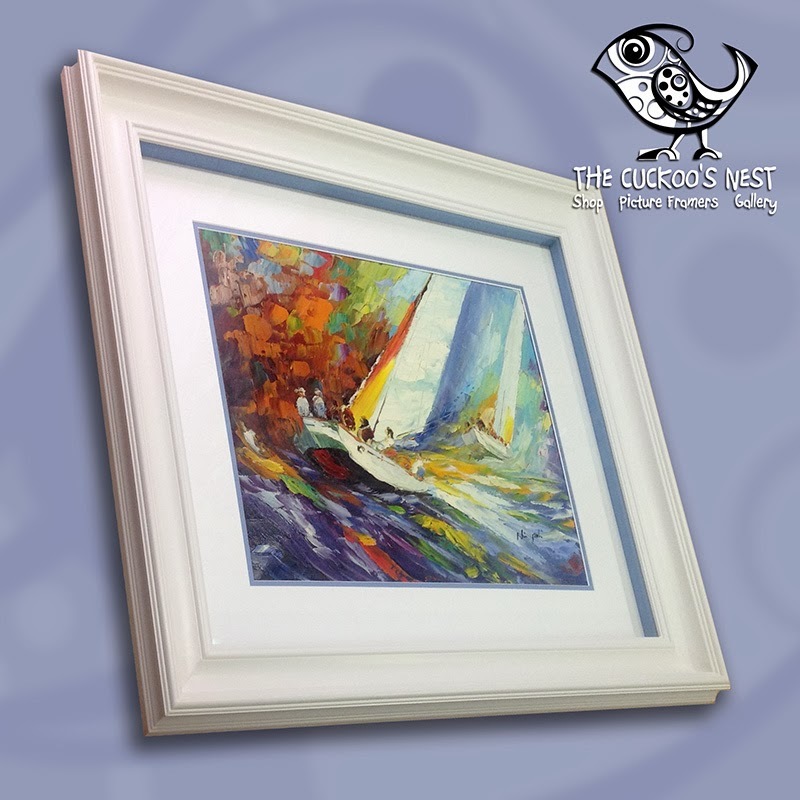 Its a simple touch that makes a big difference when framing canvases. 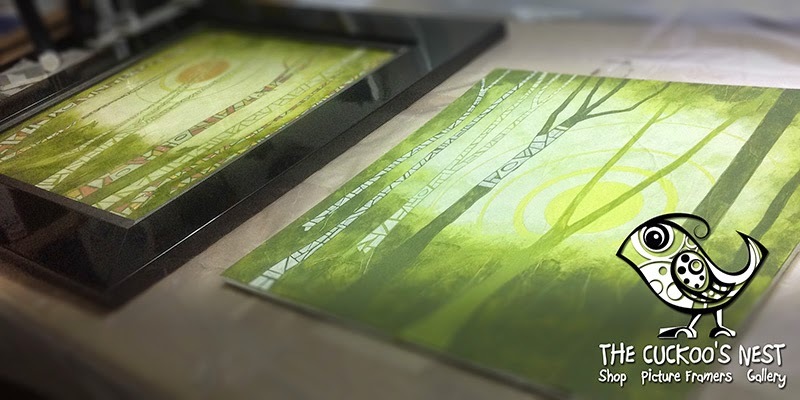 This gorgeous racing print is by Tim Layzell. 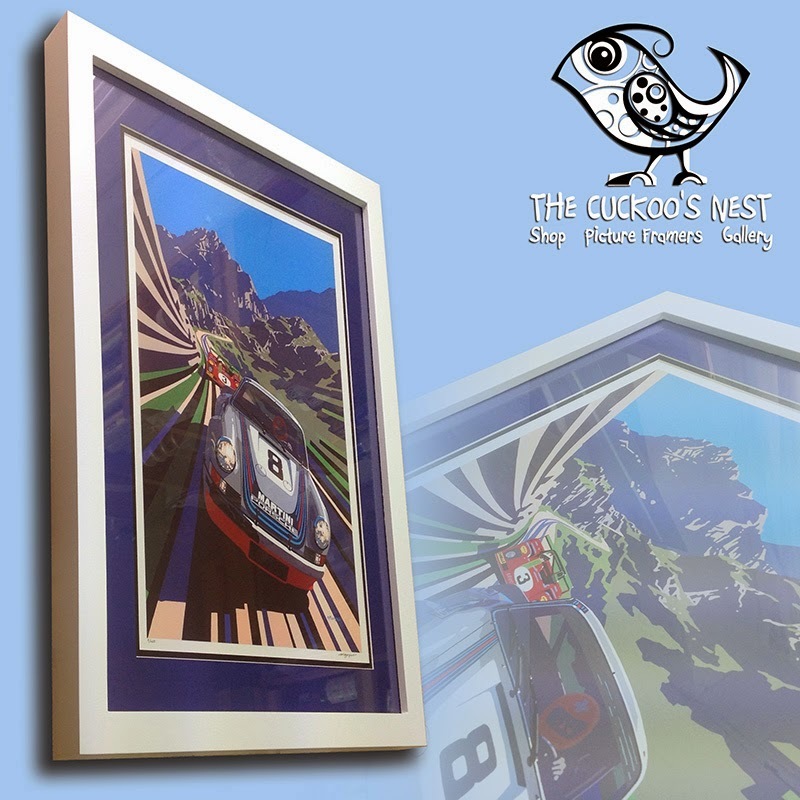 Titled ‘Carrera takes Targa’ it showcases Layzell’s dynamic, graphic style perfectly. 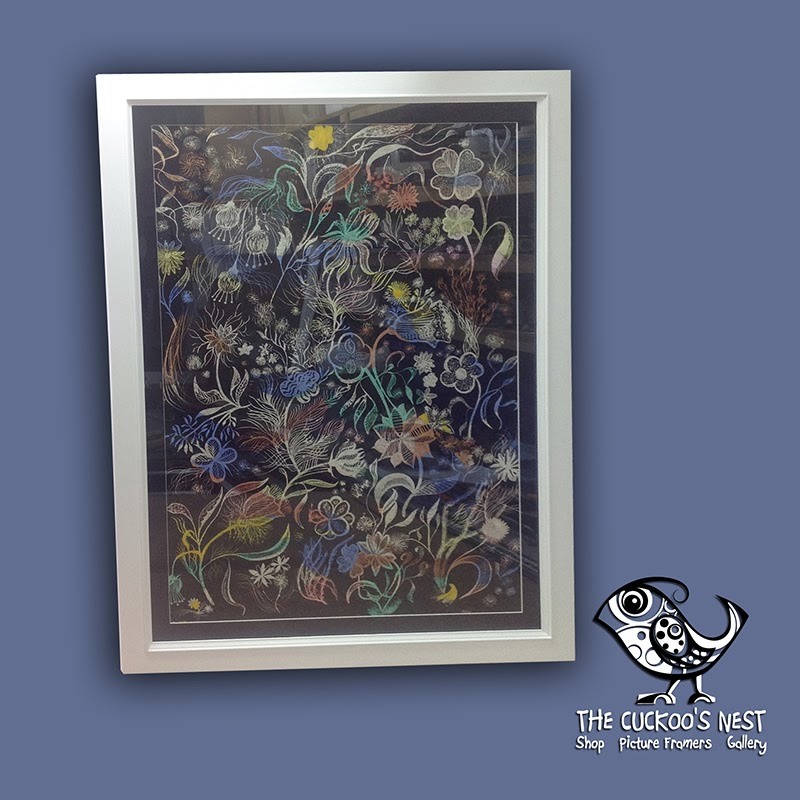 We’ve framed it with a double mount of blue over black and used UV glass to protect the print. 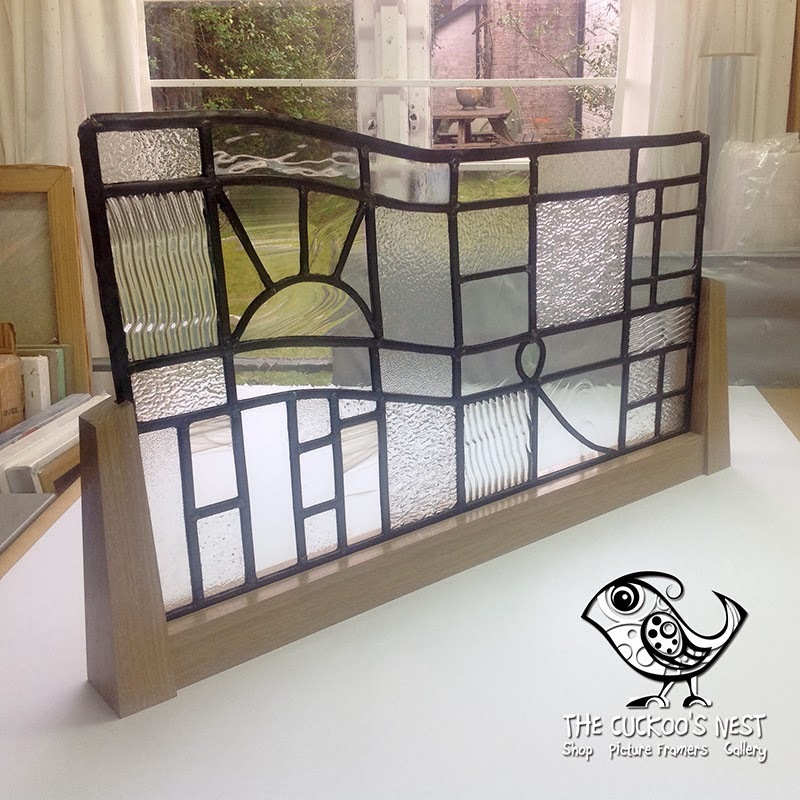 The frame was machined down to a slightly thinner size than standard, to get the perfect width and depth for the piece, this was then gessoed, sanded and painted. 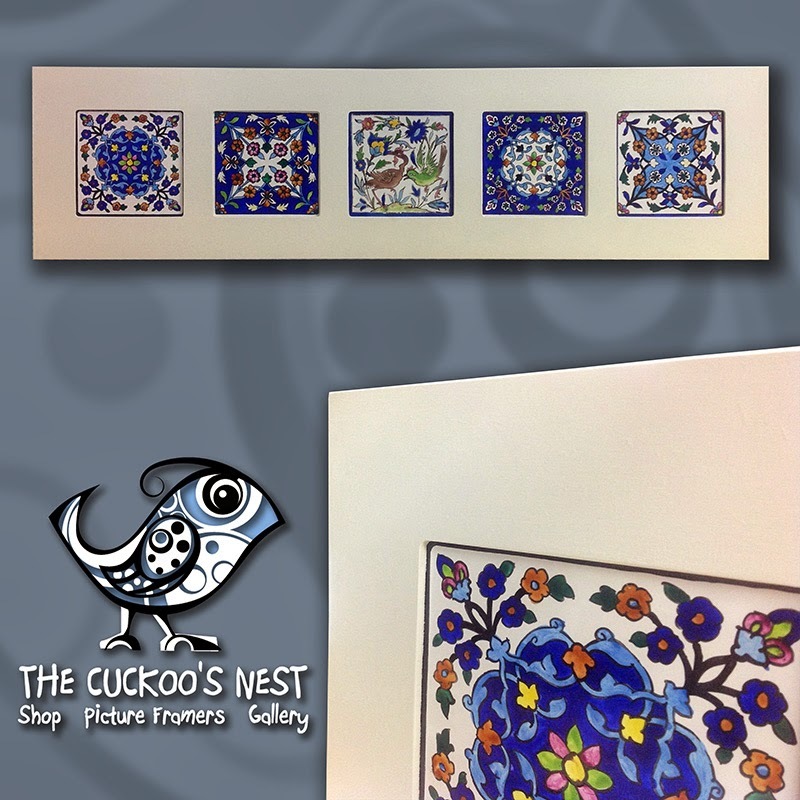 For these beautiful tiles we've built a solid frame with routed openings. 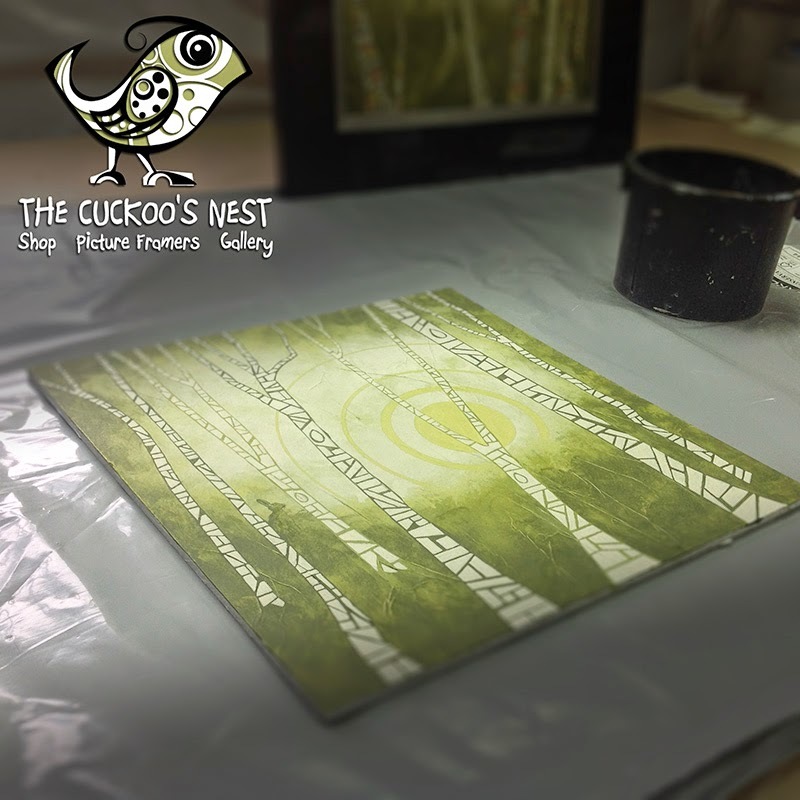 Some of the tiles are slightly different sizes, so each is carefully fitted and held in place with individually cut foamboard supports. 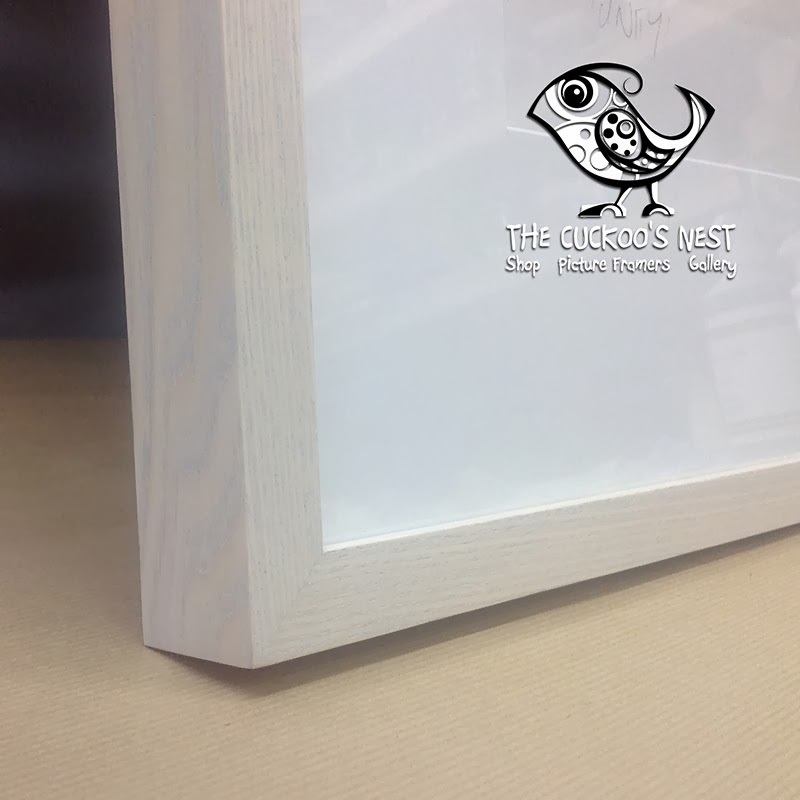 The frame has been finished with an off white eggshell paint and the final result is a clean contemporary way of displaying these beautiful pieces. 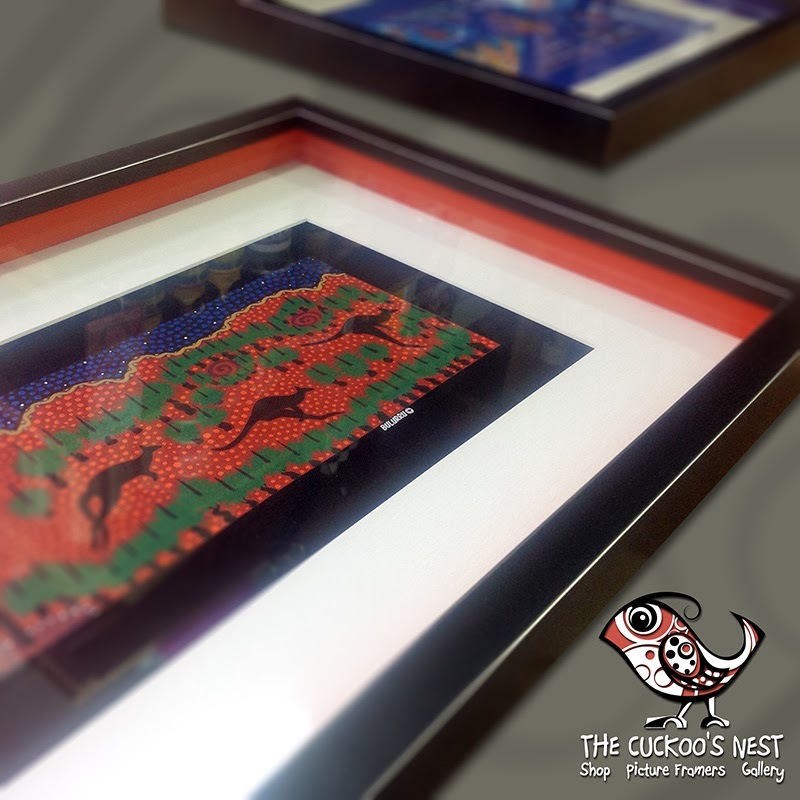 These are a couple of aboriginal style prints on cloth from Australia. 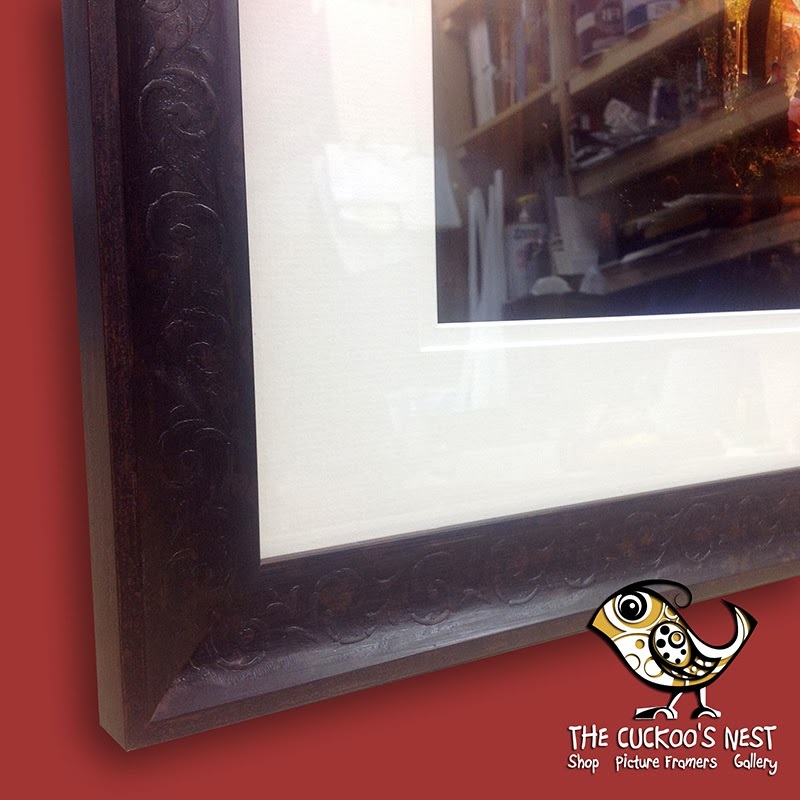 We used a black frame with silver detailing and an off white mount. 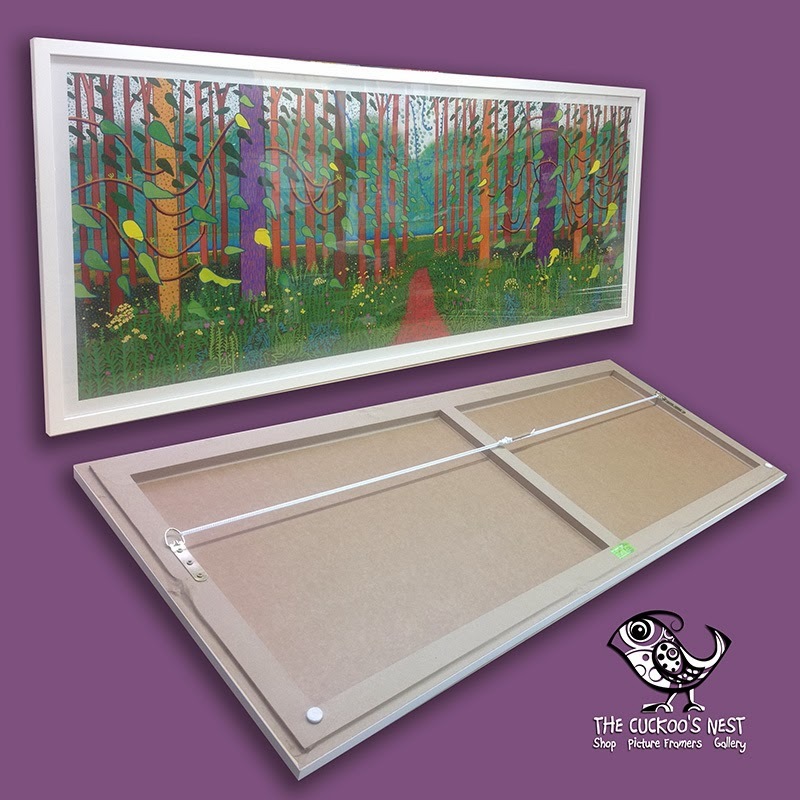 We've set the artwork at the back of the frame using coloured sidewalls in each frame, one blue and one orange to compliment the colours in the artwork. 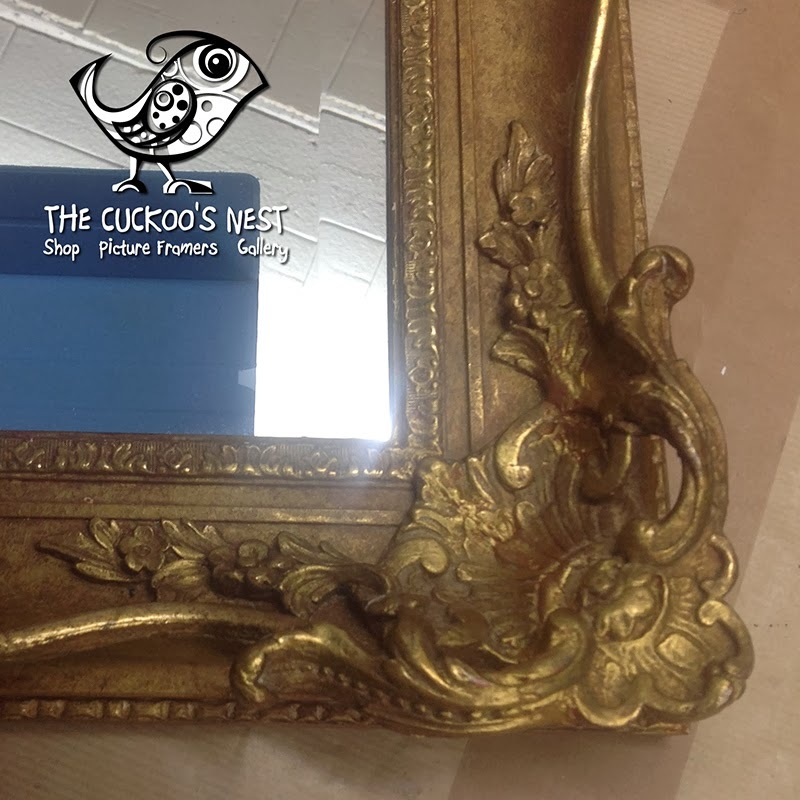 These lovely mementoes of our customers trip ‘down-under’ have now become pieces of artwork to be treasured. Here’s a piece a young art collector brought in for framing. 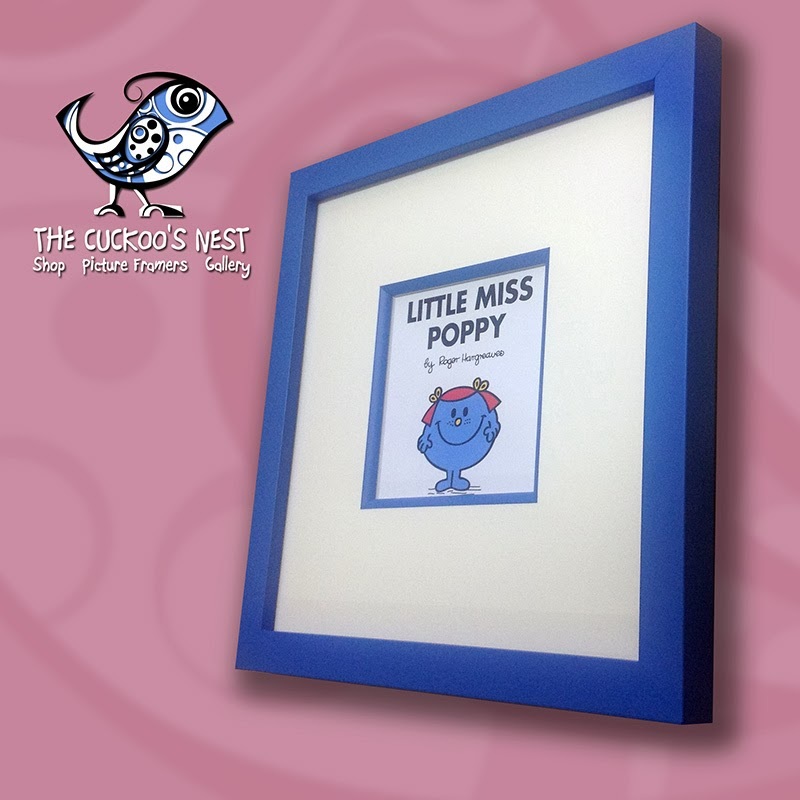 We used a bright blue frame with matching slip and an off-white mount….looks great :) So, which Mr Man/Miss would you choose ? 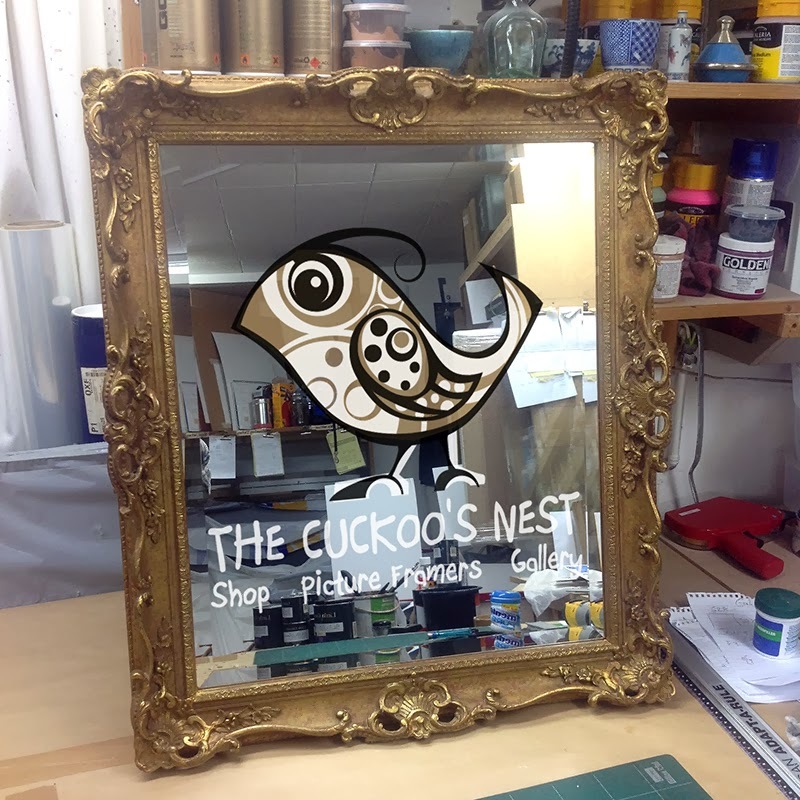 Normally at the Cuckoo's Nest we try and steer our customers towards modern, contemporary framing as much as possible, but occasionally traditional is the way to go. 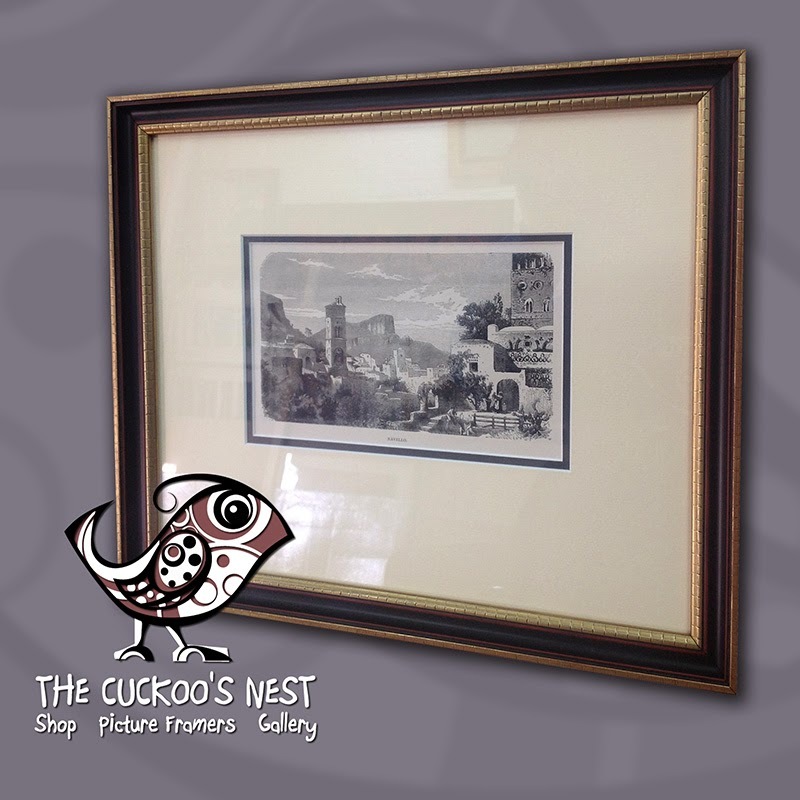 Such was the case with this beautiful little print of Ravello, our customer was having the piece framed as a gift for an older gentleman so we selected this thin black and gold frame moulding. In the past this might have been coupled with a hand lined mount, but this really does give a picture a dated feel. 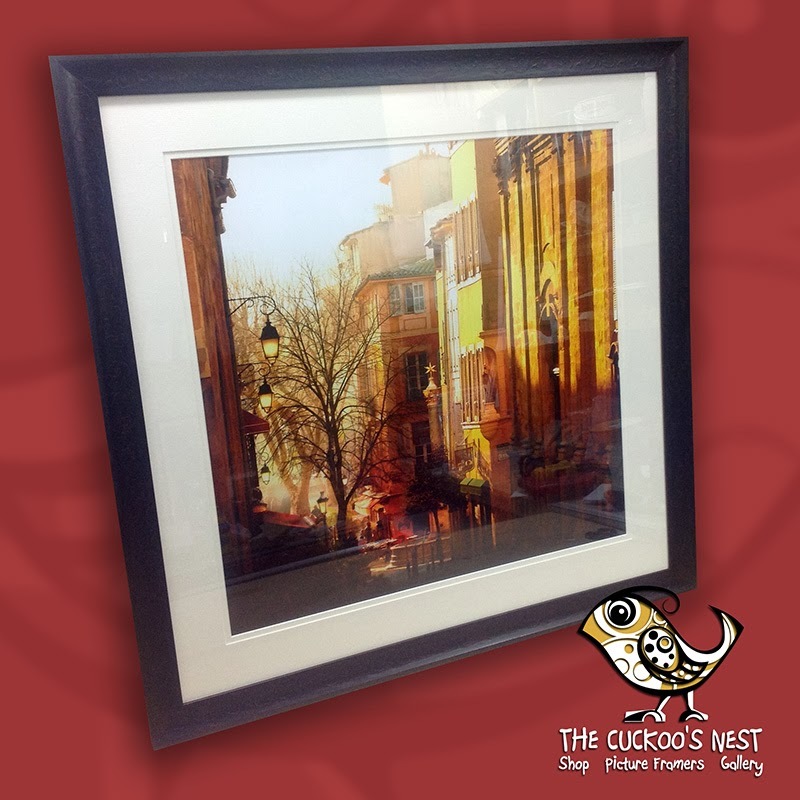 Instead of that we opted to use a double mount with a dark grey lower mount, this balances the colour of the print with the frame and gives us a traditional looking frame with a fresh feel. This is a lovely silk print of some fish, the colours are amazing, this photo really doesn't do them justice. 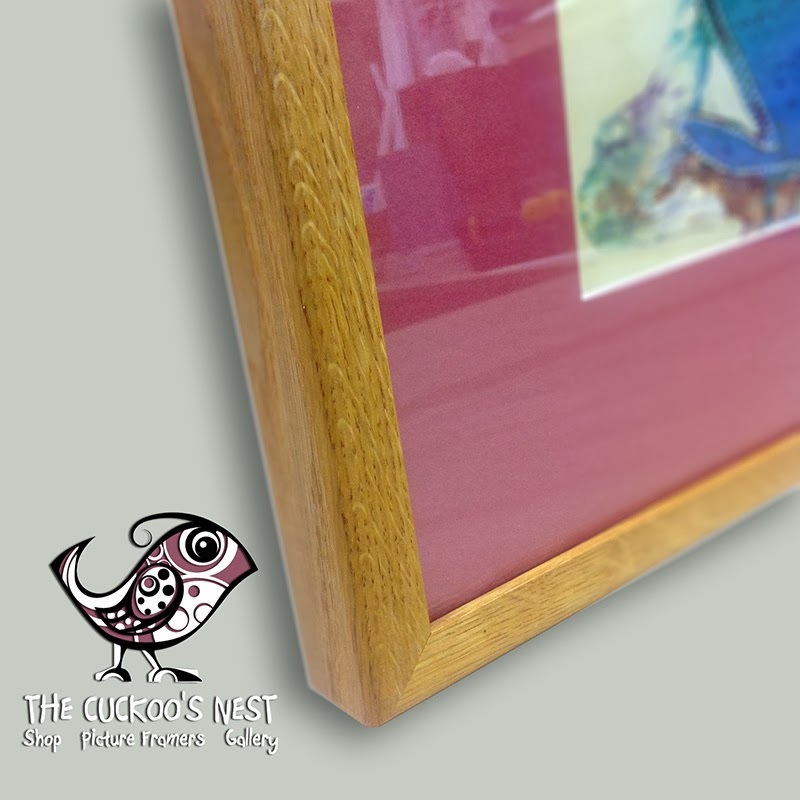 We've used a rich deep red mount and an oak frame which we've button polished to really bring out the warmth of the wood. Button polish doesn't work with everything, but the colours in this are so rich, it's the perfect choice. 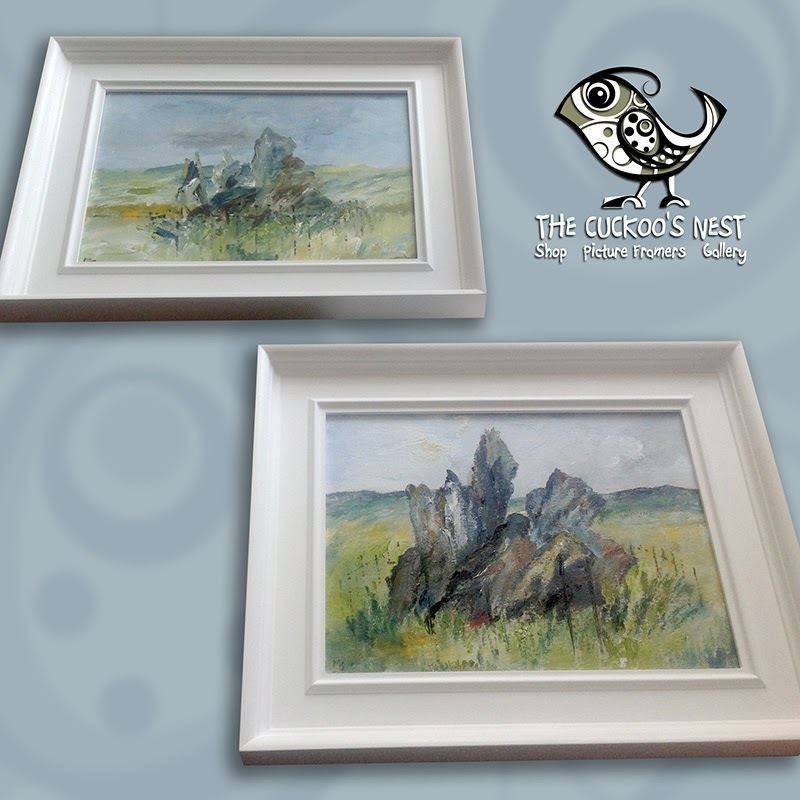 These beautiful paintings of the Rollright Stones are by Mandy Selhurst. 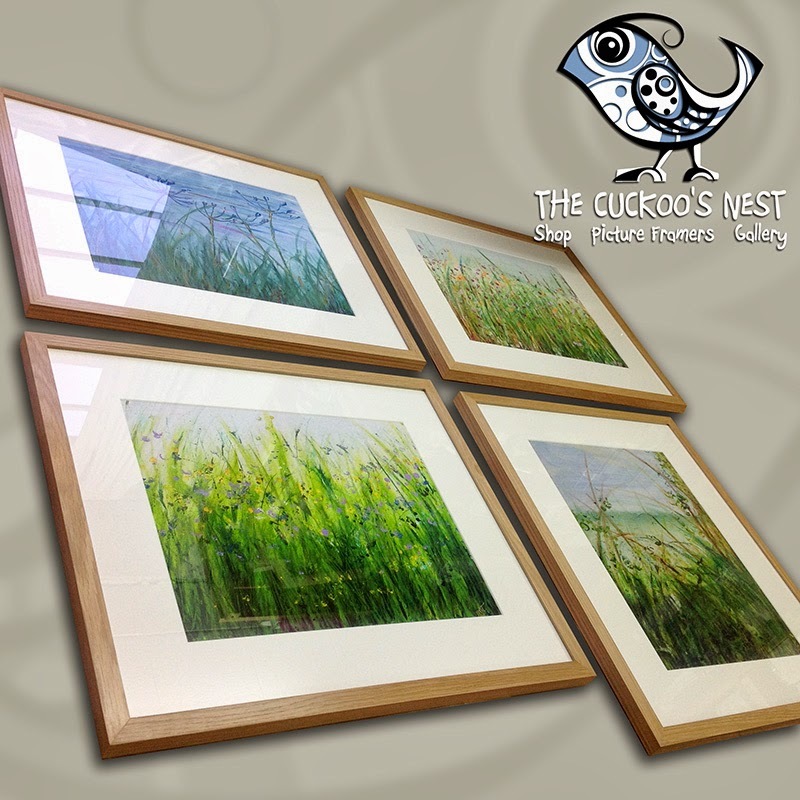 We framed a set of three in these hand painted white frames for Mandy and they are now hanging in the SOTA gallery in Witney. I'd imagine they'll sell very quickly so head over to SOTA and take a look at them before they're snapped up. 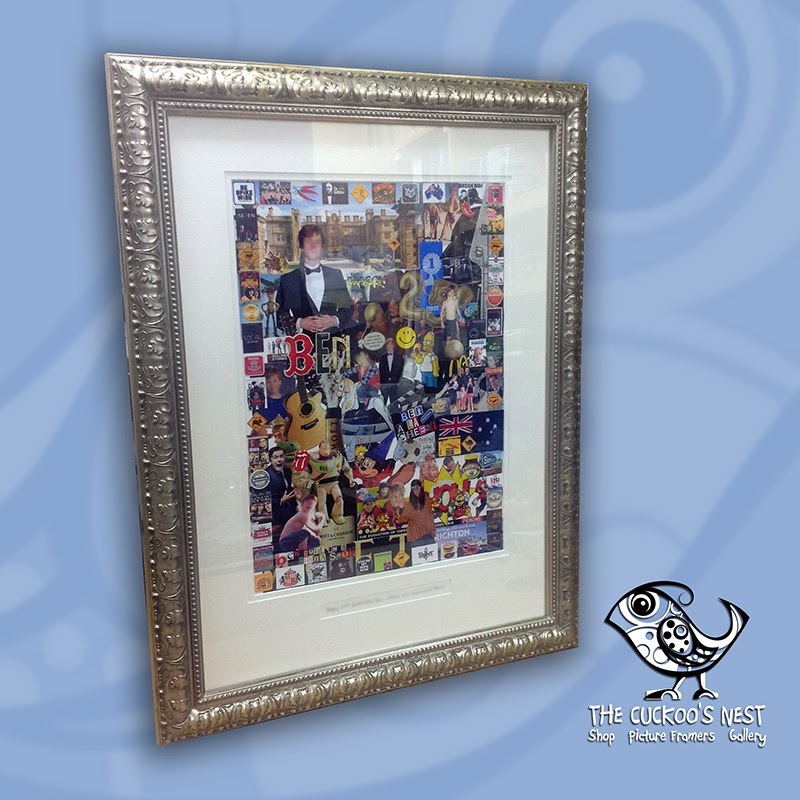 Here is a piece by a customer of ours who makes these amazing collages commemorating her family members birthdays, anniversaries etc. They are so detailed, with photos, tickets, badges, all sorts of things highlighting different memories and events in someone's life. 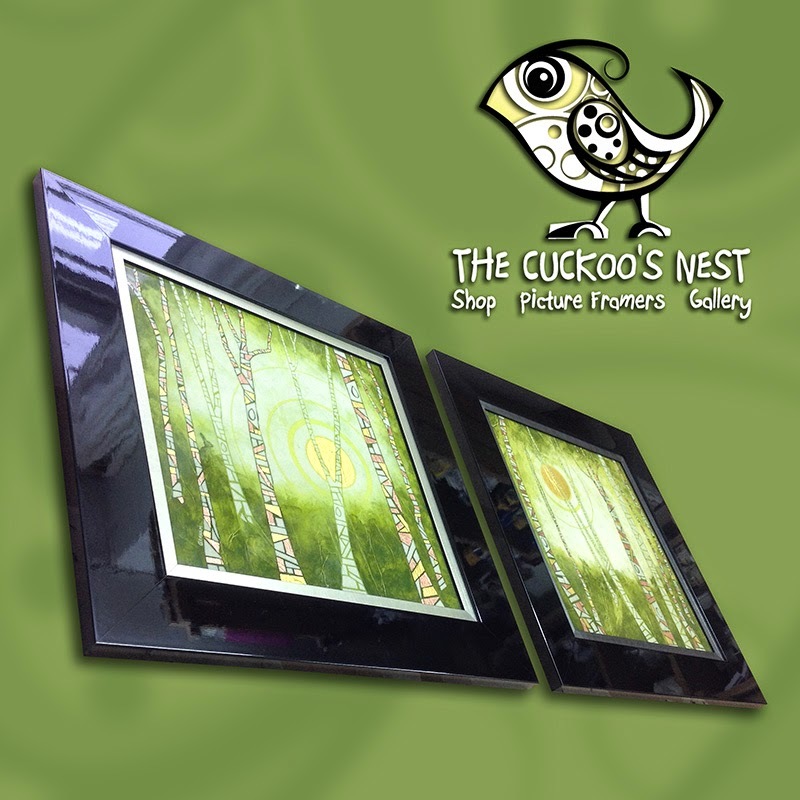 Framed in these rich, ornate silver frames, with double mounting on the main image and a single mount opening for a small dedication at the bottom they make a wonderful gift for the recipient and an amazing record of memories to be treasured. 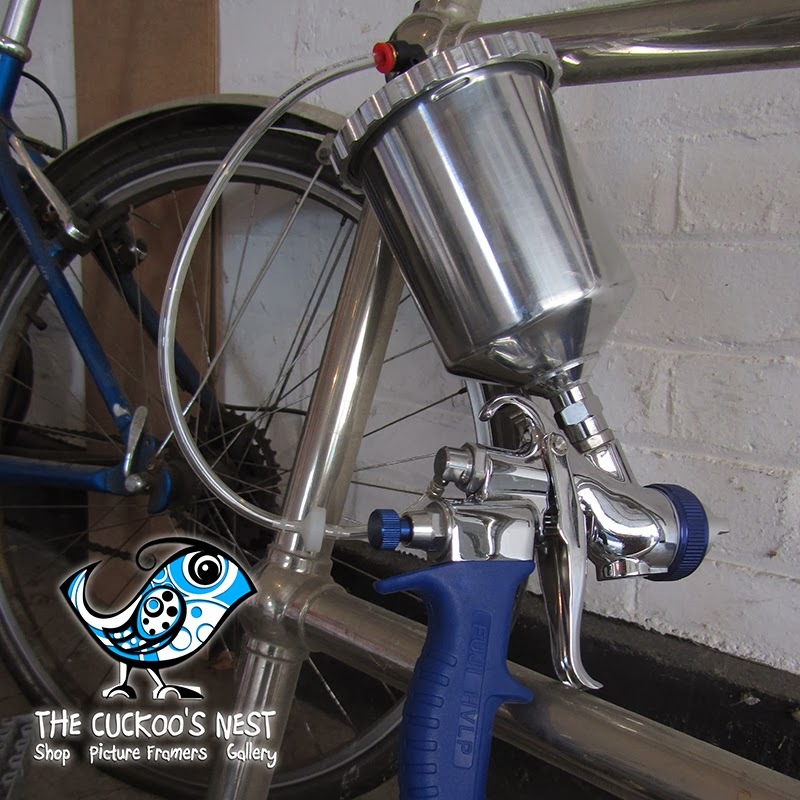 A great idea for anyone wanting to hand make a really special gift. 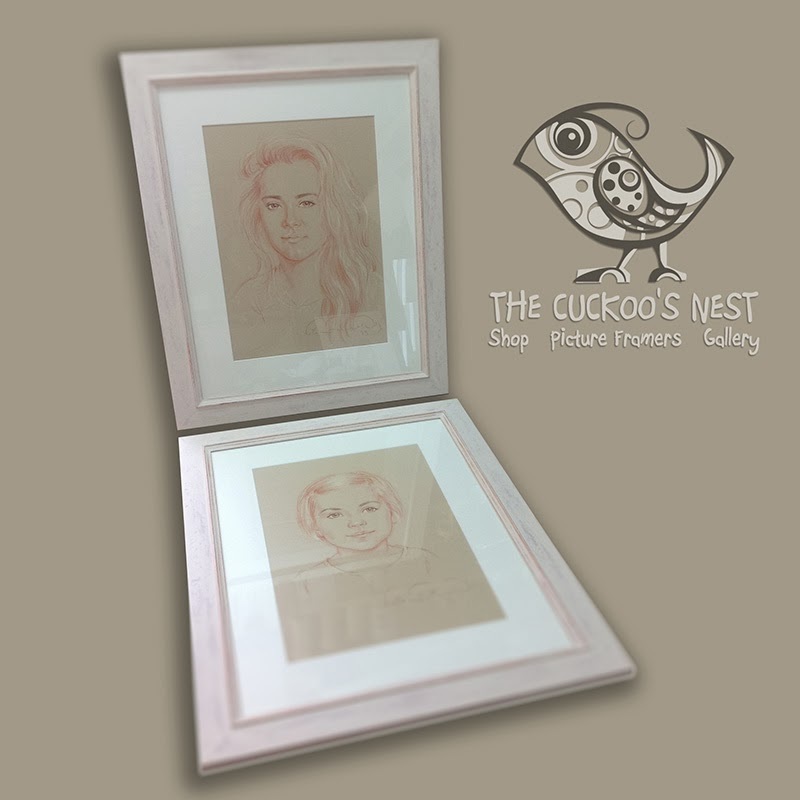 To frame these two beautiful pastel portraits our client wanted something modern, but with a French, shabby chic feel. 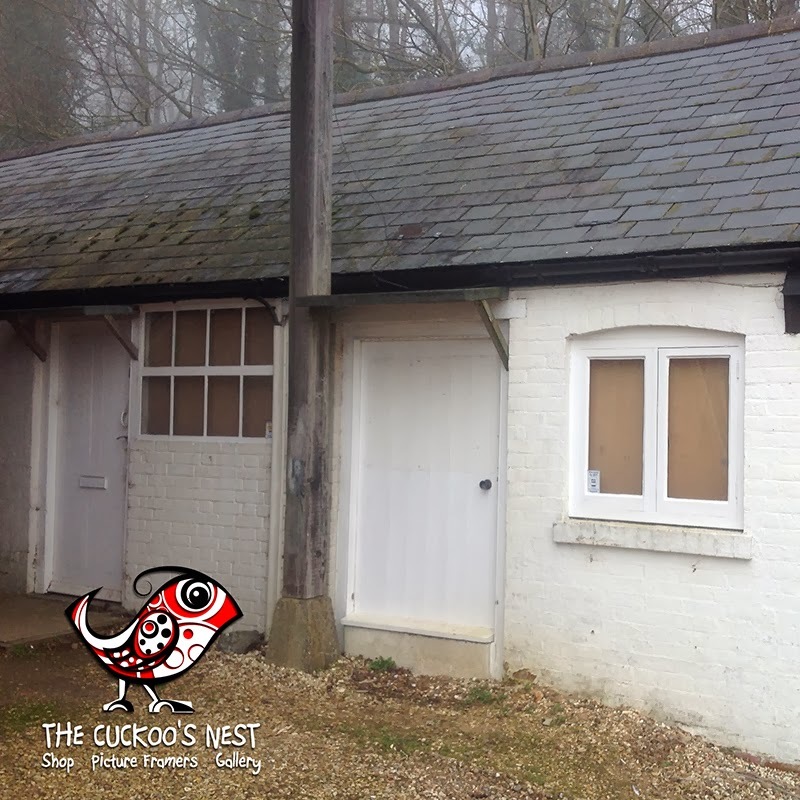 We accomplished this by selecting a clean, modern, bare wood moulding and giving it a shabby chic finish. 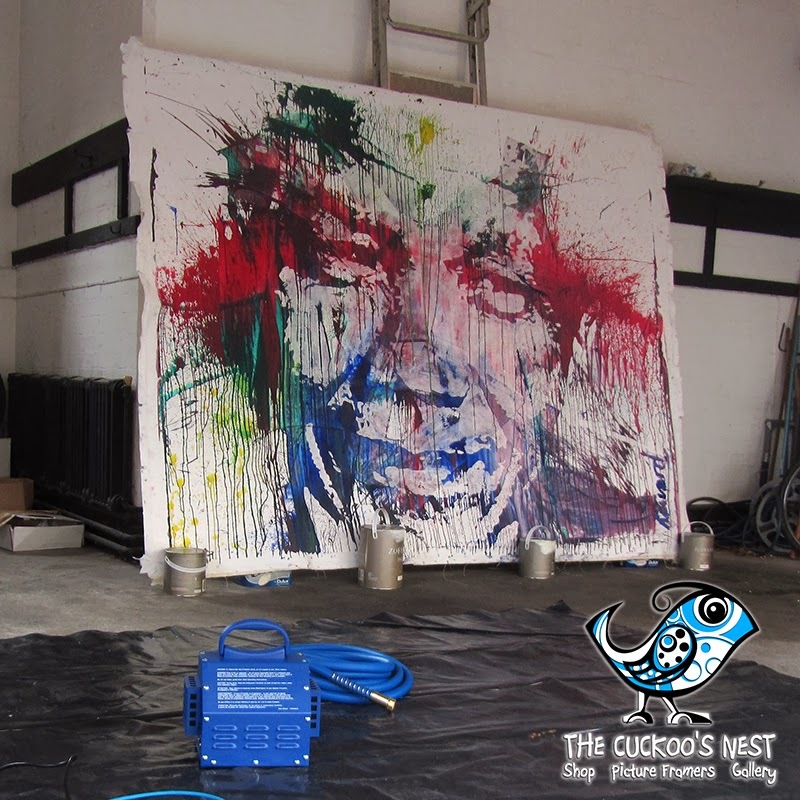 To get this look we first primed the wood and then painted it in a red/brown tone to match the pastels used in the artwork. 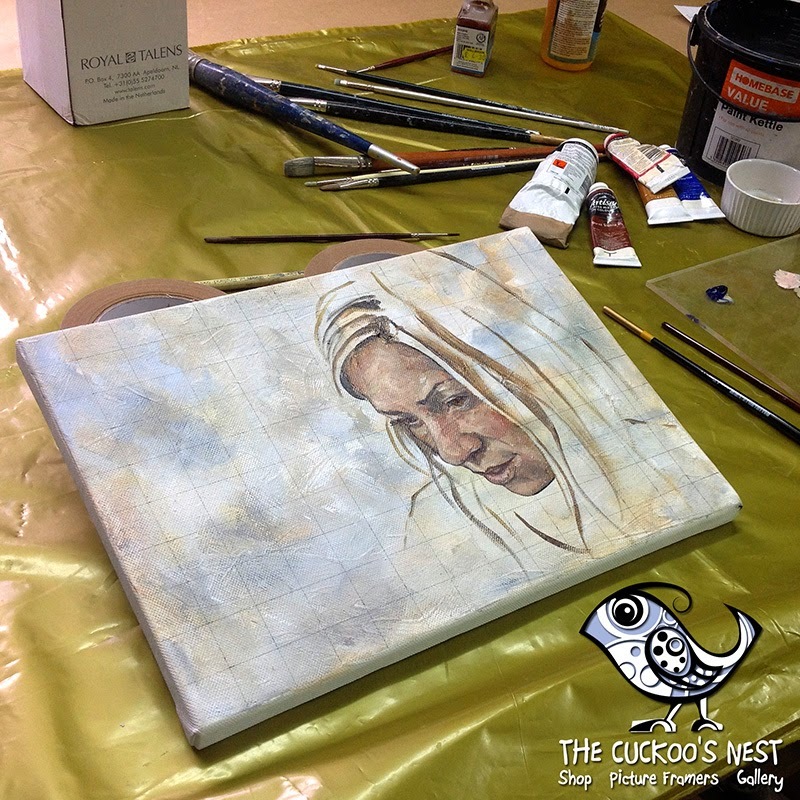 Once dry, this was over painted in a warm, off-white colour and again left to dry. 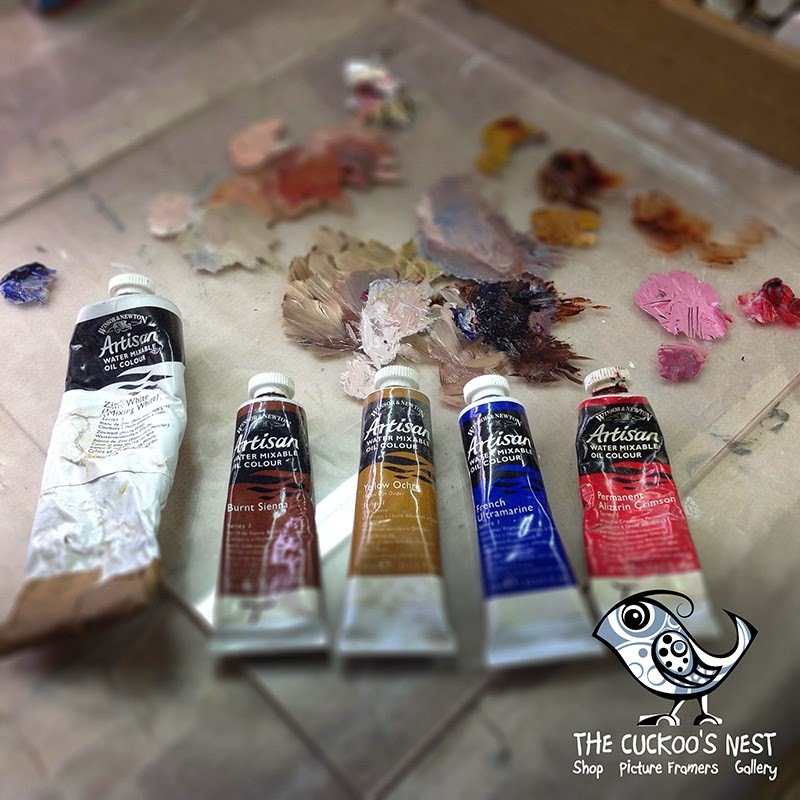 The frames are then gently sanded to reveal just the right amount of the colour underneath. 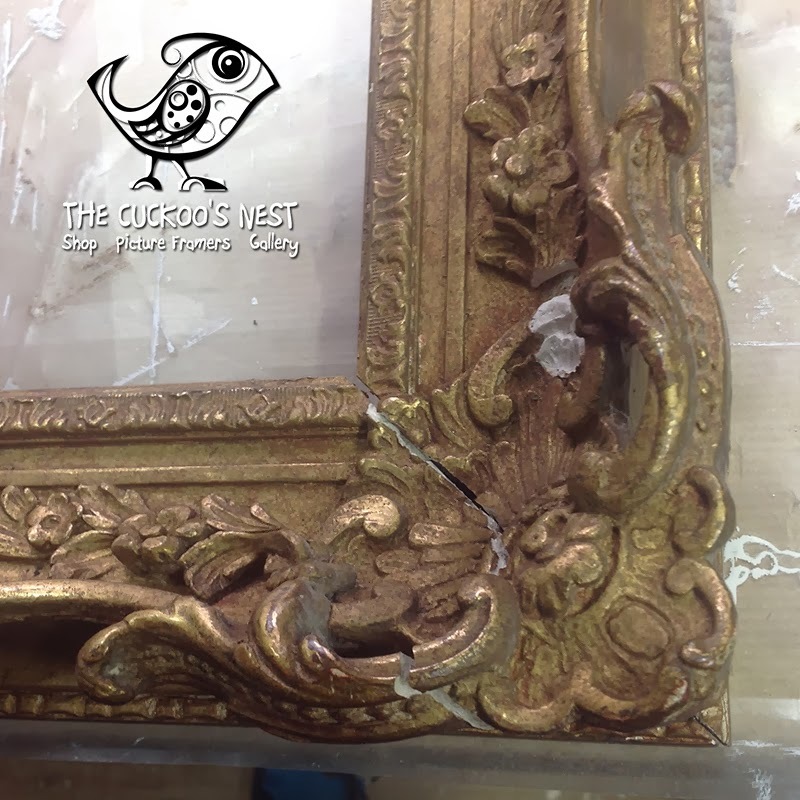 A couple of washes of thin off-white we're then applied to soften the effect and after a final dry the frames were waxed and polished. This has given the frames a lovely warm, soft feel that perfectly matches the pastel portraits of these two sisters. 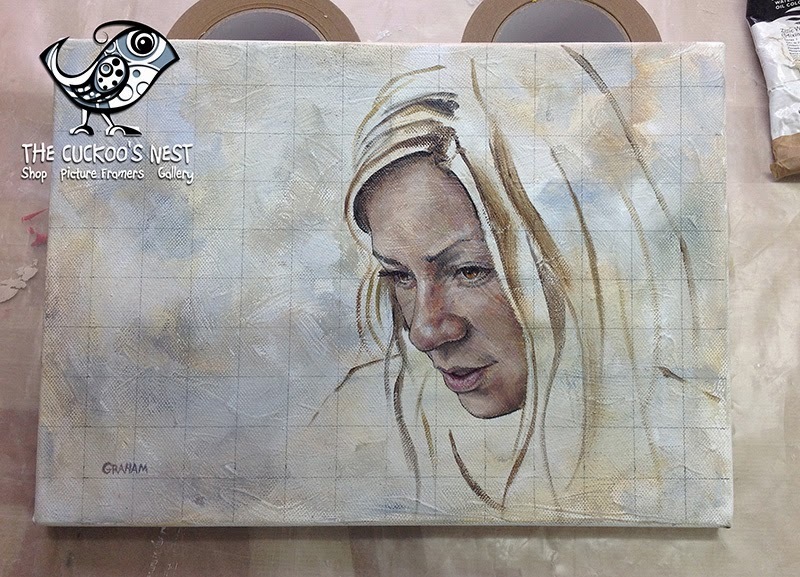 I hadn't seen a picture like this in ages, the paper is coloured using wax crayons, this is then painted over in black and the design then scratched thought the paint to reveal the colours below. 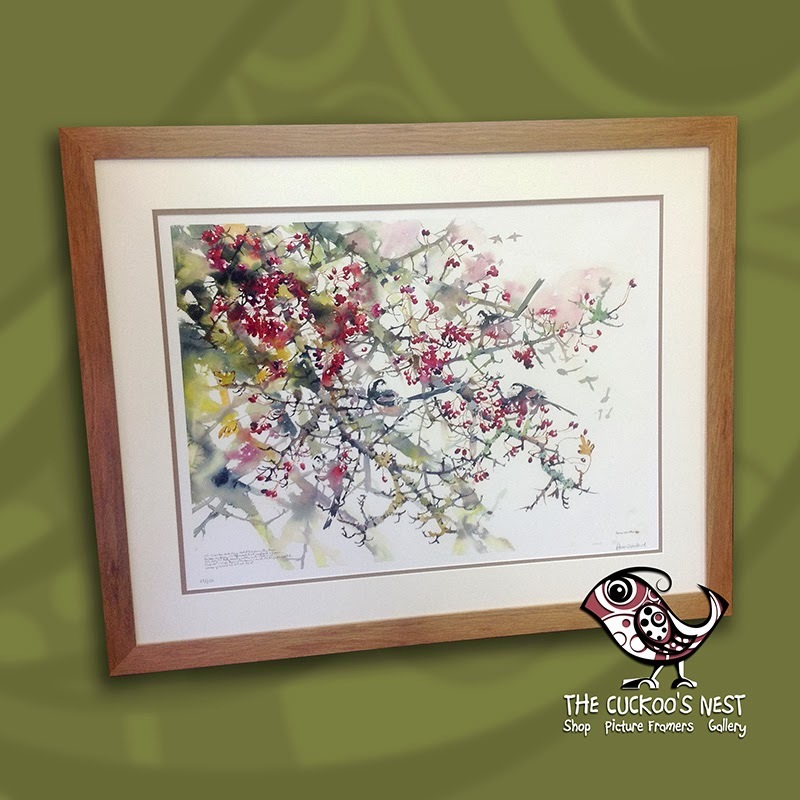 The floral design on this example works really well and makes a gorgeous piece of art. 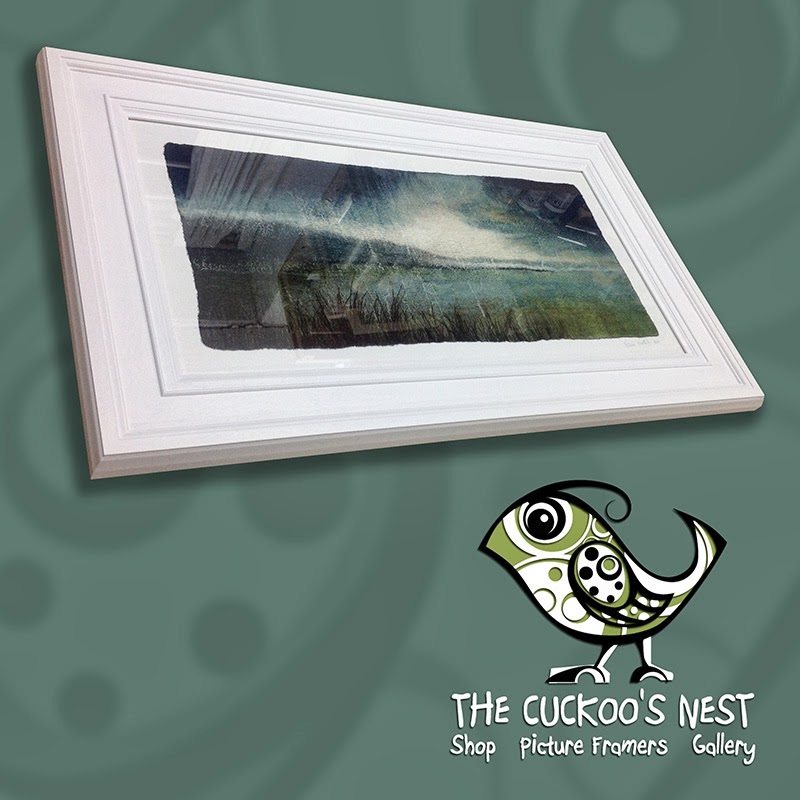 We used a black mount with a white core to give the artwork a clean, crisp edge and then added a hand-painted white frame and standard glass. A lovely memory of a young artist at work. 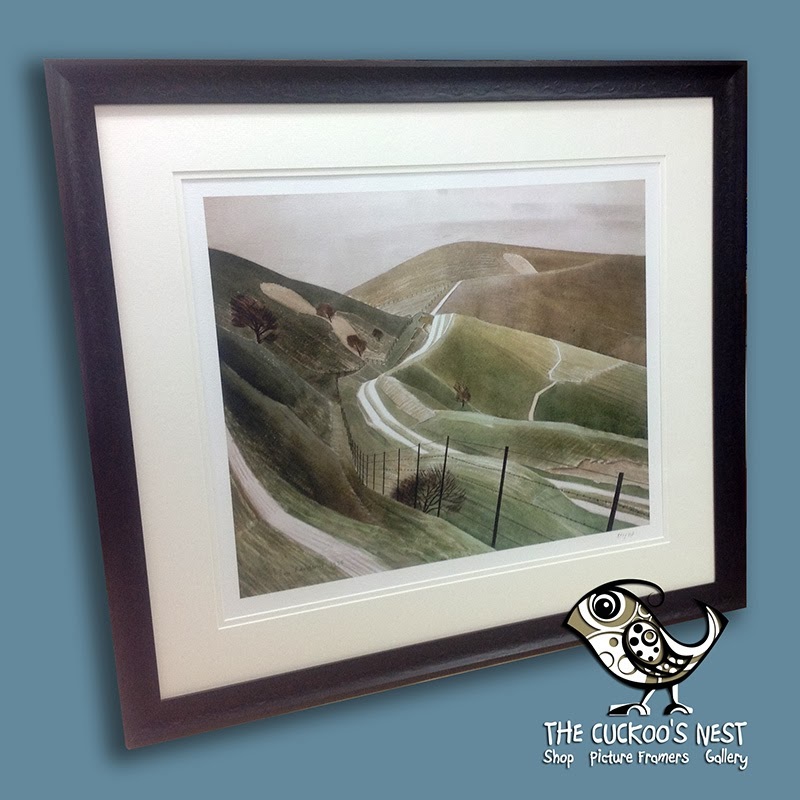 Eric Ravilious was a fabulous artist and here's a print by him we had in for framing last week. 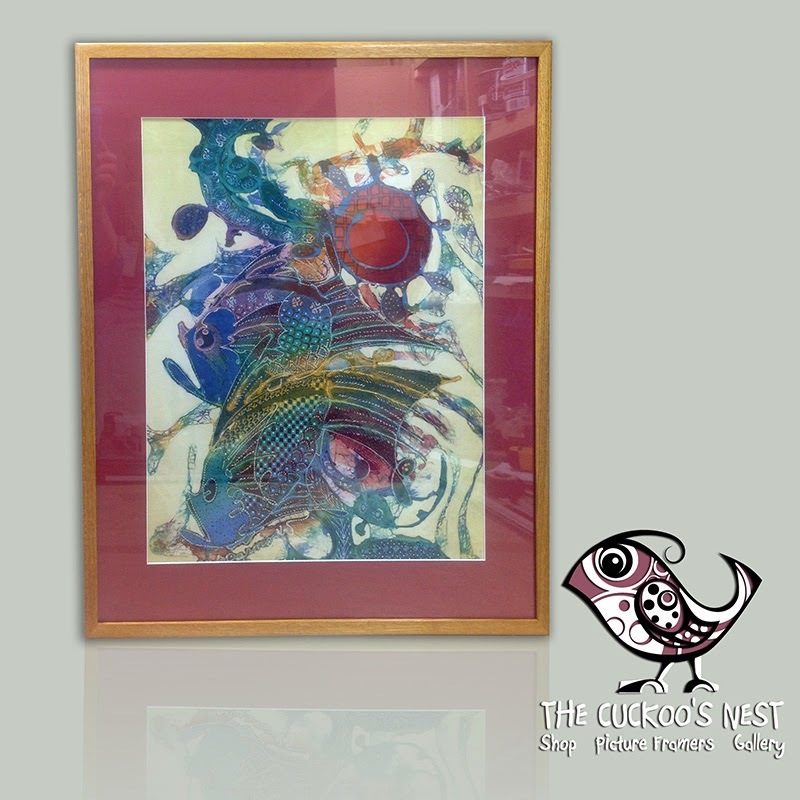 This is a wonderful example of his work and we've used a delicious Mantilla frame, double mount and Artglass to present it beautifully. 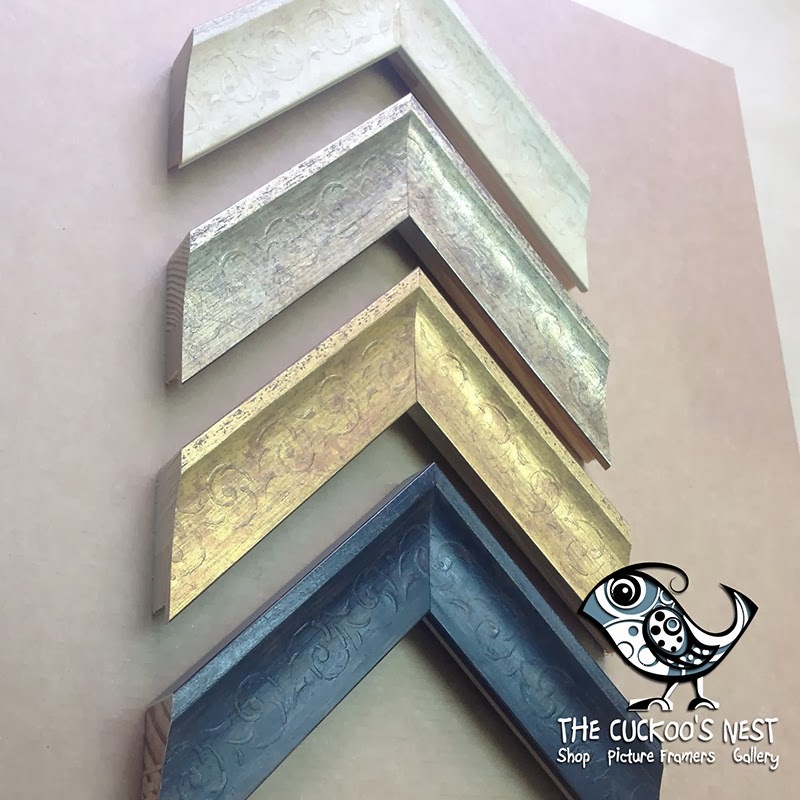 The Mantilla range of frames has been proving very popular of late, it comes in Black, Gold, Silver and Ivory and has a gorgeous satin finish that adds a luxury touch to those special pieces of artwork, along with the 'invisible' Artglass, this is the perfect way to frame such a fantastic work of art. 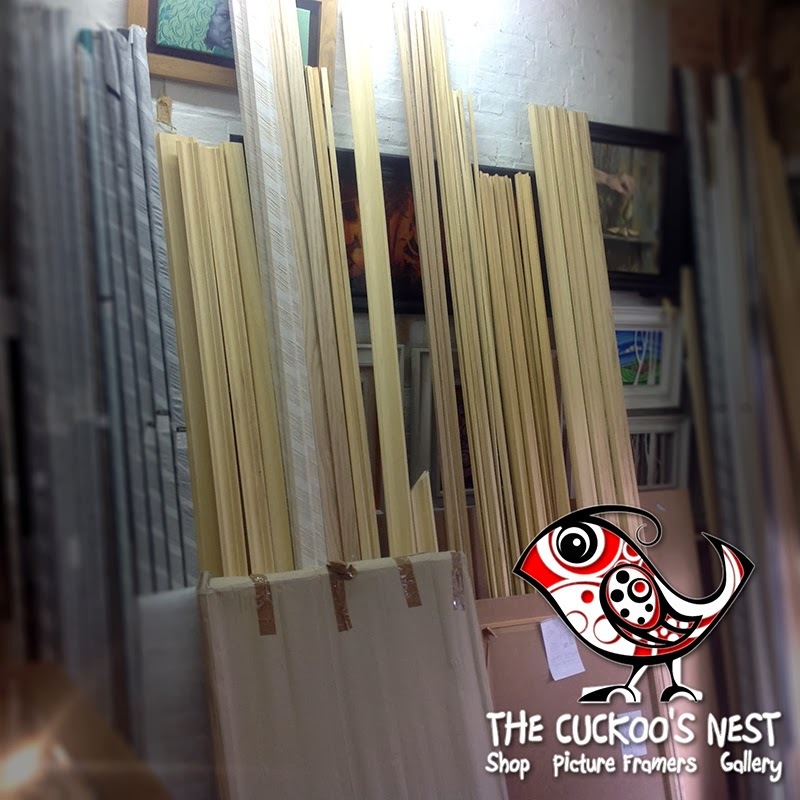 Here we have a couple of large posters that needed framing in thin white frames. 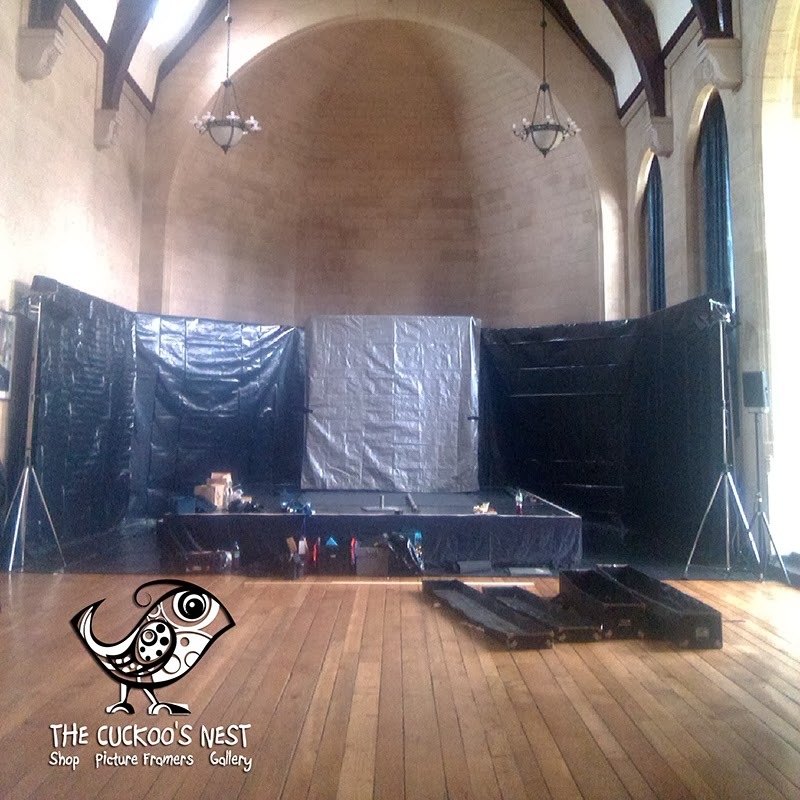 As these frames have minimal strength and the glass in them is pretty heavy, we needed to make a couple of 'sub frames' to hold everything together. 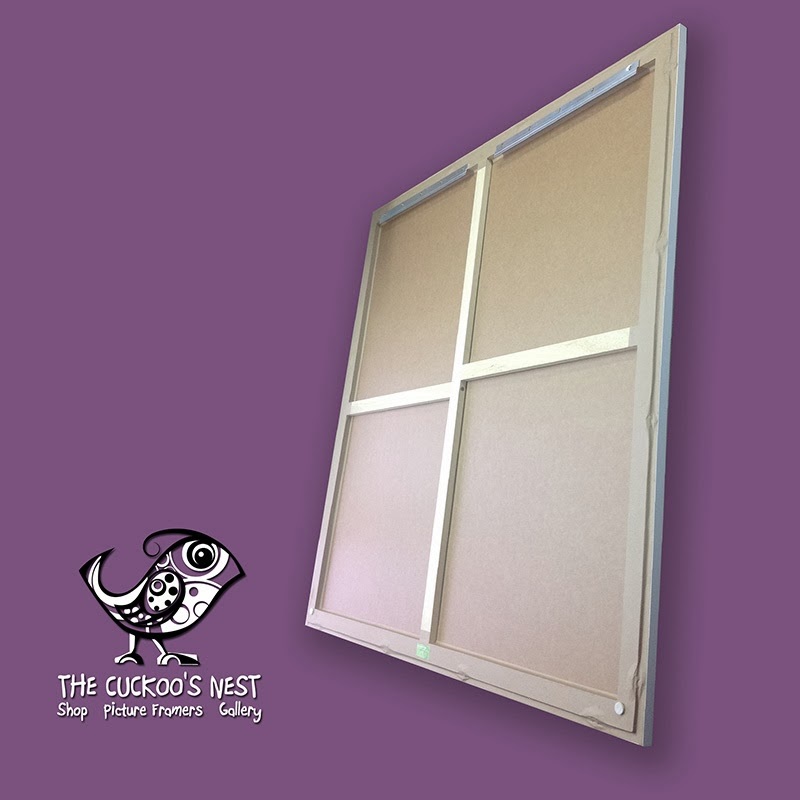 A sub frame is simply a strong wooden frame attached to the rear of the main frame out of sight. The long thin Hockney poster was hung in the usual way with a cord across the back. 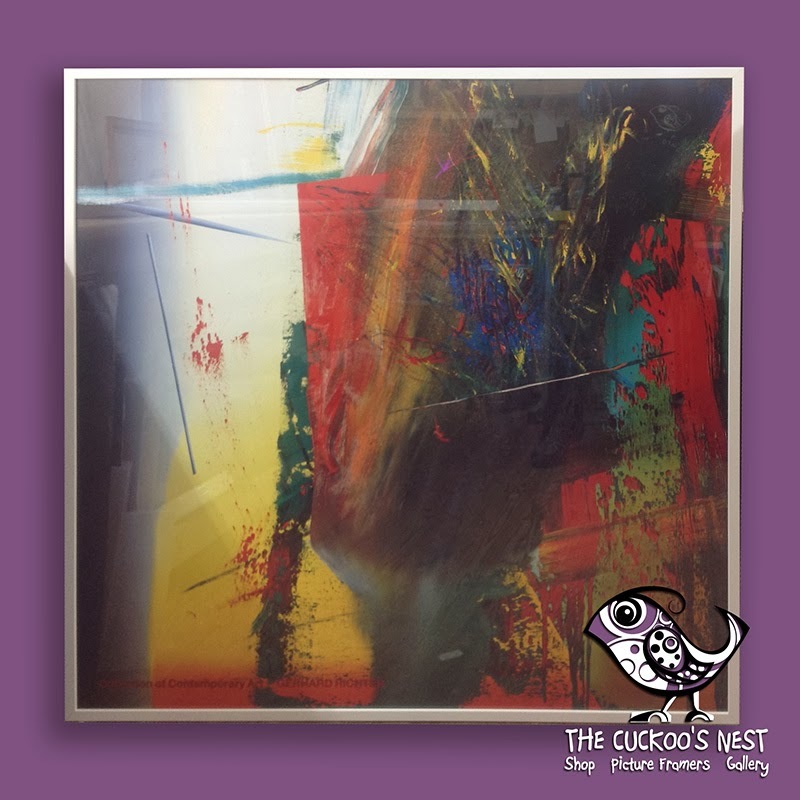 But the large square Richter piece was too heavy for this, so we added two split batons to the top, these are the two strips of aluminium you can see in the photo. Each strip is one of a pair, with the other screwed to the wall, the two parts then lock into each other, securing the work firmly. It's a simple and strong way of hanging heavy pieces. One of the artists taking part is Amarita Vargas and this picture titled ‘Unity’ is one of the works we’ve framed up for her this week. 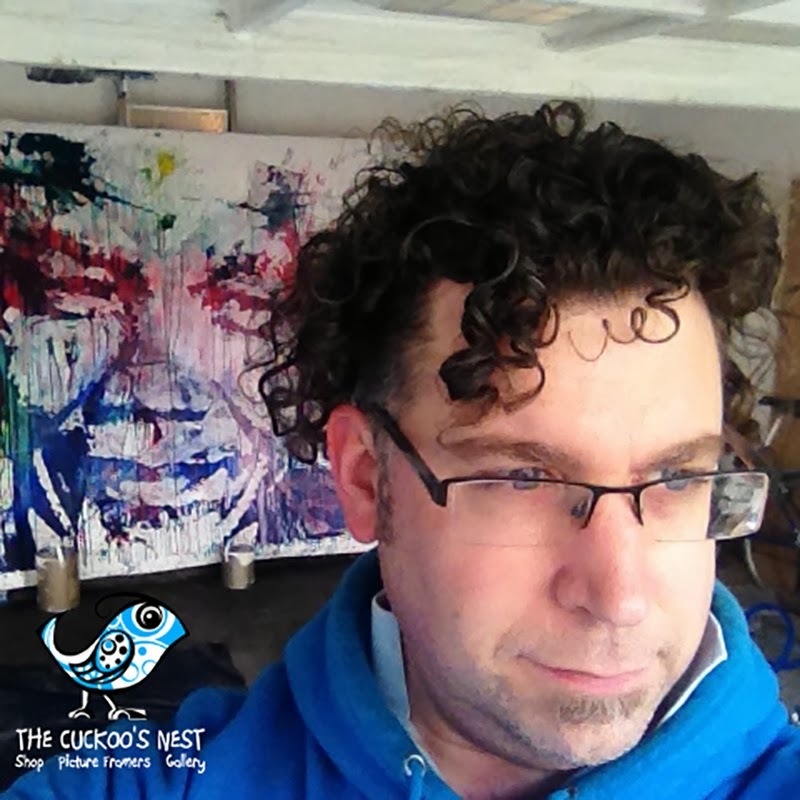 Her work ranges from abstract to figurative and all have a beautiful flow to them. 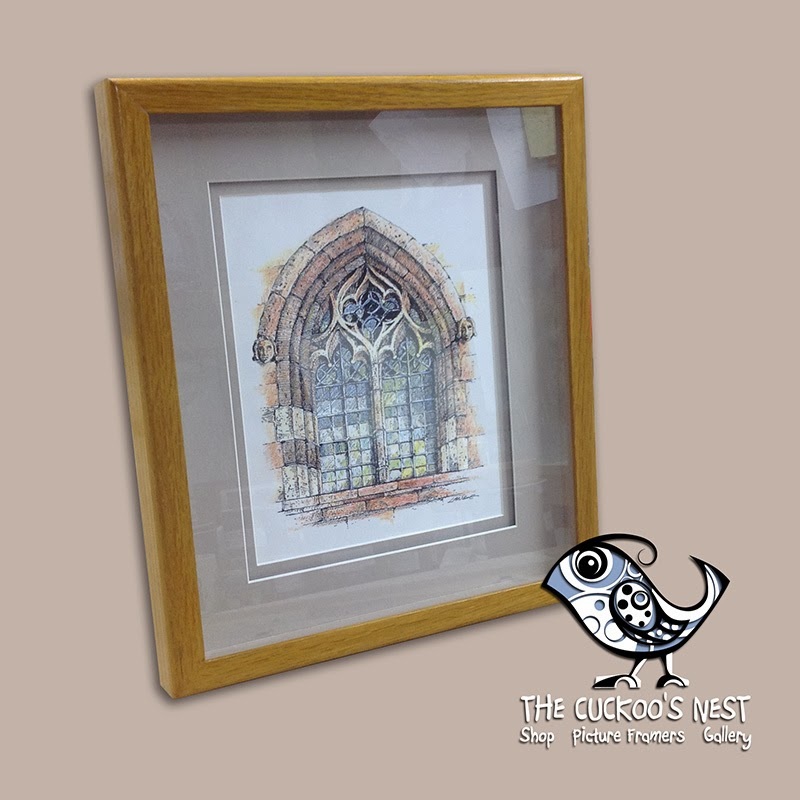 This piece is framed in limed Ash, with a simple snow white mount.